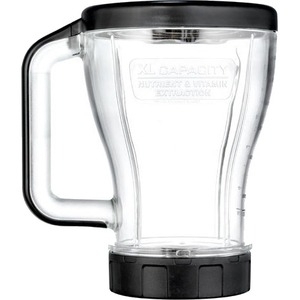 XL Nutri Ninja Jar is the perfect compact tool to create meals & drinks for the family in seconds! Utilizes interchangeable Nutri Ninja Pro Extractor Blade that Ninja is known for! 48 oz. Capacity - create multiple servings of your favorite juices, smoothies & sauces while still maintaining compact design. Pro Extract Blade - interchangeable blade is able to take full volume of foods and break down into the smoothest results! Blade not included. Durable - Tritan material. BPA Free & Dishwasher safe. Chrome/Black. Compatible with BL480, BL481, BL482, BL487, BL488W, BL490, BL491, BL492, BL492W, BL486CO.